As its name reflects, this unit within Baltimore's Mercy Medical Center provides transitional care to short-term residents. With a total of 35 certified beds, this is one of the smaller nursing care providers in the area but not atypical of a hospital based short term. Good Samaritan has a similar setup. Medicare covers short-term nursing home stays after a hospitalization so it just makes sense for the hospitals to provide their own facilities for the patent's convenience (and profit). Baltimore's Mercy Medical Center, effectively the parent company, provides little or no detailed description of Transitional Care Services. The hospital service directory simply lists a transitional care unit, which apparently is the same as the entity Medicare lists as "Transitional Care Services at Mercy Medical Center." Apparently, it is a pretty nice set up. Residents stay in private apartments and have a lot of activities for the patients. Medicare tells us it also a good nursing home. I got Medicare's overall top rating of 5 stars based on its last standard Medicare inspection in December, 2015. If you are a patient hospitalized at Mercy, you are probably going to take a spot in this facility if you have short-term nursing care needs. But you have a lot of options in the area. Maria Health Care Center, Inc.: By definition, few nursing homes get a 5-star rating from Medicare, and Transitional Care-Mercy Medical was one that did. It also got 5 stars on staffing and 4 stars on its health inspection. But of all the luck, this facility sits just one-tenth of a mile from Maria Health Care Center, another Baltimore facility - but one that got 5-star ratings from Medicare across the board. If you could not get into Mercy for some reason, this seems like a pretty decent option. Riverview Rehabilitation and Health Care Center: Physically the next-closest nursing home to Transitional-Mercy in Baltimore, this facility is nowhere close in terms of the Medicare ratings. Transitional-Mercy beat Riverview in three main Medicare categories, including with its overall 5-star rating, versus Riverview's 2 stars. FutureCare Homewood: One of four FutureCare facilities in Baltimore that are located very close to Transitional-Mercy in Baltimore, Homewood does offer some real competition. It comes second in the overall Medicare rating, 4 stars to 5, but it edges Transitional-Mercy on quality measures, 3 stars to 2. FutureCare Charles Village: Located about three blocks from its sister facility (FutureCare Homewood), FutureCare Charles Village presents less competition to Transitional-Mercy. Three out of four of its main Medicare scores are 3 stars (average), and Transitional-Mercy excels on all three - notably the overall score, for which Transitional-Mercy gets 5 stars. FutureCare Sandtown-Winchester: This FutureCare facility, within two miles of Transitional-Mercy in Baltimore, is above average, according to the Medicare ratings, but it falls behind Transitional-Mercy by one or two points in three of the four main Medicare rating categories. FutureCare Canton Harbor: FutureCare Canton Harbor got Medicare ratings very close to the same as those of sister facility FutureCare Sandtown-Winchester, and based on those ratings, it offers about the same level of competition to Transitional-Mercy. Fayette Health and Rehabilitation Center: This Baltimore nursing home is above average, in terms of its Medicare ratings, but one notch below the scores of Transitional-Mercy in three of four main rating categories. The Green House at Stadium Place: Like Fayette Health and Rehabilitation Center, this Baltimore nursing home scored below Transitional-Mercy in three of four main Medicare categories, except that its scores were even lower than Fayette's. Part of that Medicare survey is a health inspection, for which Transitional-Mercy (as we'll call it for short) got a 4-star rating. It was found to have a total of 4 deficiencies - better than the 11.4 deficiencies on average for Maryland, and the 7.1 deficiencies on average nationally. The oddity is that 3 of the 4 deficiencies here were in the category of quality care. Transitional-Mercy had no deficiencies in six of the eight measured categories in the health inspection. Its fire safety inspection was perfect: zero deficiencies. This facility has not had any Medicare complaint inspections since at least October, 2015 (whereas many other facilities have), and it has had no federal fines or payment denials in the past three years. Its record is very clean. With a total of only 35 certified beds, this facility was designed to be small. And at last official count, only 19 of those 35 beds were occupied - giving Transitional-Mercy one of the smallest resident populations anywhere (we know of none smaller). By contrast, the average resident population, nationally, is 86.2; the average nursing home headcount in Maryland is 107.5, over five times higher. Transitional-Mercy pairs its small residential population with what appears, based on the Medicare numbers, to be a huge nursing staff. The amount of nursing time per resident each day here is incredible. 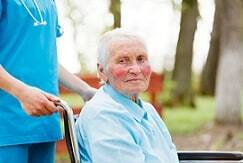 Medicare tabulates how much time nursing home residents get with nurses. For all categories of nursing, residents at Transitional-Mercy got 6 hours and 24 minutes a day - well over three times the Maryland and U.S. averages. With RNs in particular, residents got just over 4 hours a day - over four times the state and national averages. And so it goes down the line: these residents got 2 hours and 23 minutes a day with LPNs and LVNs (licensed practical nurses, licensed vocational nurses), more than two and a half times the Maryland and U.S. averages. Certified nursing assistants gave these residents about 50 minutes more per day than the state and national averages, and physical therapists gave them 24 minutes a day (compared with the 9-minute Maryland average and 6-minute U.S. average). Numerically oriented Medicare gave Transitional-Mercy an overall rating of 5 stars for staffing, as well as 5 stars for its RN staffing in particular. Before we give Mercy the "best nursing home ever" award, some context is necessary. A short-term stay facility is always going to give more nursing hours and treatment. But it is still fair to say that this facility is doing a very good job of providing staffing to treat its patients. Then we hit the anomaly. One of Medicare's four main rating categories is for quality measures: numerical gauges of how much of what type of care residents receive. Medicare gave Transitional-Mercy a 2-star rating for quality measures - in jarring contrast to its other category ratings of 5 stars or 4 stars for this facility. In its stats, Medicare distinguishes between short-stay and long-stay residents. Transitional-Mercy had no data for long-stay residents, probably because (being a transitional facility) it has no long-stay residents. So Medicare could base its quality-measure ranking for this facility solely on its nine categories for short-stay residents. Transitional-Mercy scored better than the Maryland and U.S. averages in five of these nine categories. Its rate of successful discharges was below average (45.6 percent, versus 59.3 percent on average statewide, 56.9 percent nationally), but its former residents were less likely than average to need rehospitalization or an ER visit. This facility beat the state and national norms for giving flu and pneumonia shots, and it scored a perfect zero percent on using antipsychotic meds (in this case, the lower the number, the better, of course). On the minus side, residents here were slightly less apt to improve their functionality (although that is a somewhat dubious statistical category because it doesn't tell us whether those residents needed to improve their functionality). Residents here were a bit more apt than average to have trouble with bedsores. Bedsores are a real issue in nursing homes but they are preventable with effort. One statistical measure leaps out as extraordinary. Medicare counts the number of residents who report having moderate to severe pain. Statewide in Maryland, an average of 13.8 percent of residents make such reports; nationally, 16.4 percent of residents do. At Transitional-Mercy, the percentage of residents reporting serious pain was 49.7 percent - three times the national average and almost four times the Maryland average. One in two residents here was in serious pain. We certainly can understand that residents might enter a facility while in pain, but that's what pain meds are for. Does that mean Mercy is doing something wrong? It may just be that it is harder to score well on these quality measures for short-term patients because there are too many variables at play in terms of the patient population. But the bedsore problem contracticts the idea that this is only reason for the lower score. In sum, there is no way to know. The numbers do not give the full story and they particularly do not give the full story when you have such a small short-term stay facility. Has someone you love suffered needlessly at Transitional Care Services at Mercy Medical Center or other Baltimore assisted living facility or nursing home that made a terrible mistake? Call our medical negligence attorneys at Miller & Zois today at 800-553-8082. We will help you explore your options. You can also get a FREE no obligation, confidential case review online. Call our elder care lawyers todayat 1.800.553.8082 or get a confidential and FREE online case review. We care about what has happened and we can help you find the best options for you.